The President of India, Shri Pranab Mukherjee said Russia has been a pillar of strength at difficult moments in India's history. 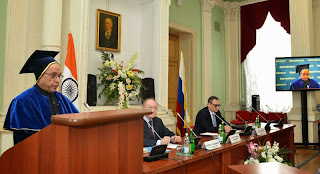 He was delivering the keynote address at the Diplomatic Academy of the Russian Ministry of Foreign Affairs after receiving an Honorary Doctorate from the Academy today (May 8, 2015) at Moscow. The President said India-Russia relations, shaped as they are by our respective historical experiences, cultural affinities, political convergences and economic opportunities, will not be affected by winds of transient global political trends. Russia has contributed to India’s development, growth and security. India will always reciprocate this support. Across Indian society and the spectrum of its political structures, there is unanimity that friendship with Russia is an important pillar of India's foreign policy. India values its close and extensive cooperation with Russia in defence, nuclear energy and security. Russia is and will remain our most important defence partner. It is also a key partner for our energy security, building on its leading role in the development of nuclear power generation in India. “I join my fellow citizens in paying homage to Gurudev Rabindranath Tagore, the first Nobel laureate of Asia and one of the greatest intellectual icons of India, on the occasion of his 154th birth anniversary. It is significant that even after lapse of a century, Tagore has not lost relevance. On one hand, his literary exuberance continues to win him millions of fans in India and across the world. On the other hand, his ideas and concepts on subjects such as education, village reconstruction, cooperative endeavour and many others still guide our path to a better and brighter world. Tagore’s concept of education, modelled on the ideal of ancient Indian ‘Tapabona’ encourages young learners to savour joyous education in the open outdoors rather than dry and dreary classrooms. The need for a symbiotic relationship between man and nature is an idea whose time has come. Similarly, Tagore’s ideas on rural reconstruction based on cooperative farming, guided by the policy of self-help and mutual harmony are reflected in the concept of “Community Colleges” which are now accepted globally. A century ago, Tagore envisaged mutual cooperation of nation and civilization, anticipating the idea of globalisation. In today’s strife-torn world where disruptive forces are raising their ugly heads to destroy peace and mutual friendship, Tagore’s message of universalism carries solace and inspires confidence in a better future. The Vice President of India Shri M. Hamid Ansari released a book entitled “Unbelievable – Delhi to Islamabad’ written by senior Advocate Prof. Bhim Singh at a function here today. Addressing on the occasion, the Vice President said that this travelogue by Prof. Bhim Singh is unique and should be read by all. He congratulated the author for bringing out such a valuable Book. The book is an effort initiated by the lawyers of India and Pakistan to work jointly to ensure that the Pakistani prisoners languishing in Indian jails are treated in accordance with the spirit of the Constitution of India. Similarly, ensures that Indian prisoners in Pakistan are not denied fair trials. The Prime Minister, Shri Narendra Modi has congratulated British Prime Minister, Mr. David Cameron, on the victory of his Conservative Party in British General Election. "Congratulations David Cameron. As you rightly pointed out- its "Phir Ek Baar, Cameron Sarkar!" My best wishes", the Prime Minister said. The Prime Minister, Shri Narendra Modi, today released a commemorative coin to mark the birth centenary of Swami Chinmayananda. Speaking on the occasion, the Prime Minister recalled the pioneering work of Swami Chinmayananda in the field of education and social reform. He described Swami Chinmayananda as a visionary, who saw the need to inculcate India's great culture and spiritual traditions, through the English medium, among an "elite" class of people, who had moved away from this heritage. Speaking about Swami Chinmayananda, the Prime Minister said that when Swami ji talked about the Geeta, he was a Gyan-Margi (one who follows the path of knowledge), and when he worked in his schools and hospitals, he was a Karm-Margi (one who follows the path of work). He said, that in this sense, Swami Chinmayananda's life is an inspiration for others. The Prime Minister recalled his meetings with Swami Chinmayananda, and said it was a matter of great pride that a commemorative coin was being issued to mark his centenary. Union Minister for Finance Shri Arun Jaitley, Union MoS for Finance Shri Jayant Sinha, Global Head of Chinmaya Mission Swami Tejomayananda, and National Director of Chinmaya Yuva Kendra Swami Mitrananda, were present on the occasion. National Sample Survey Office (NSSO) in their 68th round (July 2011-June 2012) on socio economic household surveys has collected information on awareness and acceptability of AYUSH. As per information available from the survey, it is estimated that about 82.6% people are having awareness of the AYUSH system and about 28.4% people are using AYUSH treatment in the country. Government of India has approved and notified National AYUSH Mission (NAM) on 29.09.2014 which envisages better access to AYUSH services through upgradation of AYUSH Hospitals, Dispensaries, setting up of co-located AYUSH facilities and 50 bedded integrated AYUSH Hospital; strengthening of AYUSH educational institutions, facilitate the enforcement of quality control of Ayurveda, Siddha and Unani & Homoeopathy (ASU & H) drugs and sustainable availability of ASU & H raw-materials in the States/UTs during 12th Plan. Further, State/UT Governments are advised to send proposal to Ministry of AYUSH through State Annual Action Plan (SAAP). The Govt. of India has established Traditional Knowledge Digital Library (TKDL) to prevent the misappropriation of patent on Country’s traditional medicinal knowledge including different aspects/techniques of Yoga. Government is promoting safe and judicious use of pesticides through Central Integrated Pest Management Centres situated in different parts of the country. Farmer’s field Schools are conducted to create awareness on Integrated Pest Management strategies. State Governments and stakeholders are being exhorted to support a ‘Grow Safe Food’ campaign centred around five essential principles of judicious use-application of pesticides on the right crop, against pests for which the pesticide has been approved, at the right time, in approved doses, and as per approved method of application through training and media campaigns in Gram Panchayats and rural areas. Advisories have been sent to pesticides dealers to educate them on judicious use of pesticides in accordance with label instructions. Government is promoting and recommending soil test based balanced and integrated nutrient management through conjunctive use of both inorganic and organic sources of plant nutrient management to sustain good soil health and higher crop productivity. Under soil health management (SHM) component of National Mission for Sustainable Agriculture (NMSA), financial assistance for training to farmers including field demonstrations on balanced use of fertilizers is provided @ Rs.10,000 per training for 20 or more participants. Financial assistance for frontline field demonstrations is also provided @ Rs.20,000 for frontline field demonstrations. Under National Mission of Sustainable Agriculture, there is a provision of financial assistance under Capital Investment Subsidy Scheme (CISS) through NABARD for establishment of bio-fertilizer/biopesticides production units (200 TPA) in which 100 percent assistance is provided to State Government up to a maximum limit of Rs.160 lakh per unit and @ 25 percent cost limited to Rs.40 lakh to individuals/private agencies. There is no scientific evidence that about 75 percent of the cultivable land in the country has been adversely affected by excessive use of chemical fertilizers and pesticides and has high level of toxins. However, indiscriminate and imbalanced use of fertilizers coupled with low addition of organic matter over years may result into multinutrient removal is greater than the addition. This information was given by the Minister of State for Agriculture Sh.Mohanbhai Kundaria in Rajya Sabha today. As per the latest report on Land Use Statistics for 2011-12 compiled by Directorate of Economics & Statistics, Ministry of Agriculture, out of total Geographical Area of 3287.3 lakh hectares in the country, 1467.5 lakh hectares is non-agricultural land/ area. Area under non-agricultural land consists of forests, area under non-agricultural uses, Barren and un-culturable land, permanent pastures and other grazing land. The reclamation of area under Non-Agricultural Land is generally not viable due to ecological and cost considerations. However, to improve fertility of soils in the country, the Government under the component of Soil Health Management of National Mission on Sustainable Agriculture (NMSA) is promoting soil test based balanced and integrated nutrient management through setting up/strengthening of soil testing laboratories, establishment of bio-fertilizer and compost units, use of micronutrients, trainings and demonstrations on balanced use of fertilizers etc. Recently, a National Mission on Soil Health Card has been launched to provide soil tested based fertilizer recommendation to all the farmers in the country. Further, Ministry of Rural Development is implementing an Integrated Watershed Management Programme (IWMP) for development of rainfed/degraded areas. The Government has approved the setting up of a Price Stabilization Fund (PSF), as a Central Sector Scheme, with a corpus of Rs.500 crores, to support market interventions for price control of perishable agri-horticultural commodities during 2014-15 to 2016-17. Initially the fund is proposed to be used for market interventions for onion and potato only. PSF Scheme provides for advancing interest free loan to State Governments/Union Territories(UTs) and Central agencies to support their working capital and other expenses on procurement and distribution interventions for such commodities. The Price Stabilization Fund will be managed centrally by a Price Stabilization Fund Management Committee (PSFMC) which will approve all proposals from State Governments and Central Agencies. The PSF will be maintained as a Central Corpus Fund by Small Farmers Agribusiness Consortium (SFAC), which will act as Fund Manager. Funds from this Central Corpus will be released in two streams, one to the State Governments/UTs as a onetime advance to each State/UT based on its first proposal and the other to the Central Agencies. The Central Corpus Fund has already been established by SFAC in 2014-15. The one time advance to the States/UTs based on their first proposal along with matching funds from the State/UT will form a State/UT level revolving fund, which can then be used by them for all future market interventions to control prices of onions and potatoes based on approvals by State Level Committee set up explicitly for this purpose. In case of North Eastern States, the State level corpus will comprise of 75% funds from Centre and 25% from the State. While the advance is returnable, the Central Government will share 50% of losses (75% in case of NE States), if any, at the time of settlement of the advance on 31st March, 2017. The Central Government likewise also intends to share the profits, if any, in the same ratio. The States could also request Central Agencies to undertake such operations on their behalf to be supported out of the State corpus. Additionally, the Centre can also requisition the Central Agencies like Small Farmers’ Agri Business Consortium (SFAC), National Agricultural Cooperative Marketing Federation of India Ltd. (NAFED), etc. to undertake price control operations for onion and potato. Procurement of these commodities will be undertaken directly from farmers or farmers’ organizations at farm gate/mandi and made available at a more reasonable price to the consumers to manage prices of perishable agri-horticultural commodities. Shri Radha Mohan Singh, Union Agriculture Minister met his Turkish counterpart Mr Mehmet Mehdi Eker for a bilateral meeting on the sidelines of the G-20 Agriculture Ministers' meeting at Istanbul yesterday. Both of them discussed issues of mutual interest and agreed to expedite holding of the 2nd Steering Committee meeting with a view to take forward the cooperation in Agriculture sector between the two countries. Union Agriculture Minister reiterated the desire of Indian Government to participate in the International Horticulture Expo being organised at Antalya, Turkey from 23rd April 2016. Shri Singh also met his US counterpart Mr Tom Vilsack yesterday and both of them discussed issues of mutual interest. Both the ministers reiterated the need for building upon the strong foundation in bilateral relations laid by recent visits of Prime Minister to US and the visit of US President to India. During the meeting it was agreed to expedite the renewal of MOU between the two countries to take the cooperation forward. USDA Secretary invited India to join the "Global Research Alliance "on Crop and Animal production as well as the "Climate Smart Alliance " and offered to write to Union Agriculture Minister outlining the action taken on both the initiatives . The Government has sanctioned 10 AYUSH Industry Clusters during the 11th Plan Period (2007-12). Out of these, 3 Clusters, one each at Kerala, Punjab and Rajasthan have been completed during last 3 years. The Government proposes to set up more number of AYUSH Clusters in the country for this purpose Development of AYUSH Cluster Scheme has been approved for continuation in the 12th Plan period (2012-17). Herbal Health Research Consortium Pvt. Ltd. 277, East Mohan Nagar, Amritsar - 143006. (i) 100% difference between road and rail transportation charge is reimbursed to implementing States/Agencies for movement of seeds produced from outside the State to the identified State Capital/District Headquarter. (ii) Actual cost restricted to maximum limit of Rs.120/- per quintal whichever is less, is reimbursed for movement of seeds transported within the State from State Capital/District Headquarter to sale outlets/sale counters.